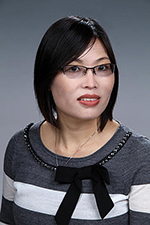 Congratulations to Dr. Jiwen Fan of Pacific Northwest National Laboratory who received the Ascent Award from the atmospheric sciences section of the American Geophysical Union (AGU). Established by AGU in 2012, the Ascent Award honors exceptional mid-career scientists. Fan is an atmospheric modeler specializing in the fields of aerosols, clouds, and climate, and her work at PNNL focuses on untangling the relationships between the three. Specifically, she has made significant contributions to the understanding of how aerosol particles impact storm (deep convective) clouds, which is one of the most difficult and complicated climate problems. "Fan has uncovered a rich variety of complex processes that contribute to the role of aerosols and clouds in the climate system," said Dr. Steven Ghan, a PNNL Laboratory Fellow and head of PNNL's Aerosol Climate Initiative. Fan's award certificate will be presented at the 2015 Fall AGU meeting in San Francisco. AGU is the largest professional organization dedicated to geophysics, and has over 62,000 members. Within AGU, the atmospheric sciences section is made up of members who are concerned with climate change, atmospheric chemistry, dynamics, radiative transfer, and other processes that affect the atmosphere. The Ascent Award has a minimum seniority requirement of eight years post-Ph.D., and despite just meeting that requirement, Fan already has 50 peer-reviewed publications, 11 of which have been cited at least 40 times. Fan received a Ph.D. in atmospheric sciences at Texas A&M University in 2007. She has won numerous awards, including the 2014 Ronald L. Brodzinsky Award and a NASA Earth Systems Science Fellowship from 2004-2007. Previously, she served on the AGU committee for two terms and is chair of the American Meteorological Society's chemistry committee.